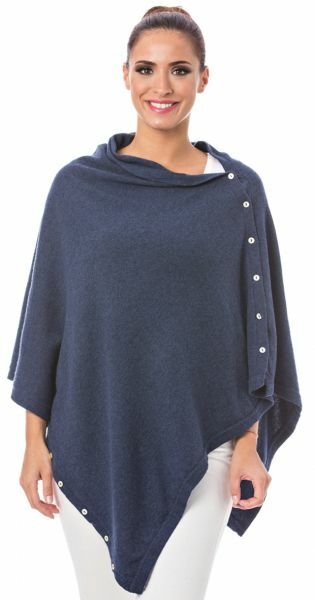 The Cashmere Poncho is soft, luxurious, cosy and stylish. Brilliantly versatile and incredibly easy to wear this poncho very cleverly transforms from a shrug to a poncho, to a scarf and a wrap just by altering the way the gorgeous little mother of pearl buttons are fastened. The Bird of Paradise Poncho is a contemporary shape that's perfect for layering up. A must for travelling, chilly evenings on holiday or simply looking chic on a day-to-day basis which makes it the perfect gift as one size fits all. Your only issue is which color to choose. Be warned once you have one you will want more! There are many colors to choose from so your hardest decision is which color to buy! The Poncho is made from a combination of Cashmere (40%), Silk (15%), Lamb’s Wool (15%) and Mix (30%) which makes them machine washable and harder wearing.